This current clamp adapter allows you to measure current without breaking the circuit, which should be attached to general multimeters for work. 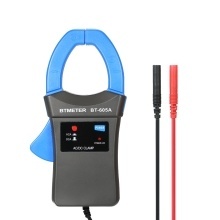 Measuring Range: 600A DC/AC current. Suitable for general multimeters. Can measure the current of multimeter and the current waveforms of oscilloscope. Clamp design and only two buttons, very easy to operate. Jaw opening of 45mm to measure current without touching or interrupting the circuit. Comes with test probes for convenient measurement. Includes LED low power indication. Note: It should be attached to general multimeter for work.